Happy Friday, Noshers! Any fun plans this weekend? I will be attending a wedding AND the NoshGirl Party! Will I see you there? 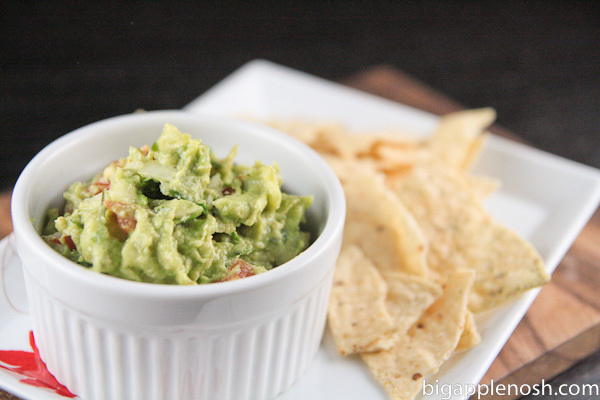 Today is National Guacamole Day! YUM! I have 2 ripe avocados in my fridge that are just begging to be eaten, so I know I’ll be celebrating! What are your favorite guacamole add-ins? While I do love guacamole, I recently had a mezze at a Lebanese restaurant I really like that kind of opened my eyes to the possibilities of making other spreads with avocado: It was just mashed avocado, feta cheese, garlic, and tomato, and it was seriously so absurdly good. Wait… I guess it’s kind of just a Lebanese guacamole! Awesome, let’s celebrate! Yum! I think I’ll whip up a batch with jalapenos mixed in. Yum – I have jalapenos in my fridge too – maybe I’ll throw one into the guac! Mmmm guacamole. I love a ton of cilantro in it. A friend of mine puts curry in his. Oooh, never put roasted corn in there before – thanks for the suggestion! Thank you! Happy Friday to you as well! As I am a fan of anything spicy, I like extra, EXTRA Tabasco sauce and horseradish in mine. Mmmm…. I absolutely adore guacamole. I need to make myself some soon – yum! Hmmm, Guac!!! I love The Nervous Cooks interpretation, it’s sooooo what I would do too, since we have an abundance of Feta over here! Have a top weekend lady! Lots o garlic and some roasted corn!